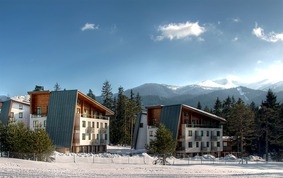 Euphoria Club Hotel and Spa in Borovets ski resort, Bulgaria. Book a bargain ski holiday in Borovets online. - 10 % discount until 15 Nov 2018. Get free overnights - 7=6! - 7=6 during 02 Dec - 22 Dec 2018; 11 Jan - 25 Jan 2019; 23 Feb - 31 March 2019. Extras are combinable with early booking offer! Location: The Euphoria Club Hotel & Spa is located in Borovets ski resort, at an altitude of 1350, just 70 km away from Sofia. The location is of unparalleled natural beauty, surrounded by forests of centenarian pine trees, alpine meadows, deep ravines, rivers, in close proximity the impressive seven Rila lakes and small picturesque villages. Accommodation: Euphoria Club Hotel & Spa offers 110 rooms, apartments and villas, creating a relaxing atmosphere, ideal for all guests. Euphoria Club Hotel & Spa invites guests to choose among spacious studios, one or two bedroom apartments and two-level luxurious villas, all with stunning views over the mountains and the ski slopes of Borovets. All rooms are equipped with furnishings of high aesthetics and quality and feature all modern comforts. Room amenities: Private bathroom (bathtub / shower), individual heating, internet access, daily housekeeping, direct telephone line, kitchen, satellite TV-radio, assigned area for ski lockers, fridge, sleepers, central heating, safe deposit box in room. All rooms are non smoking. The complex features 5 two-level luxurious villas. Each villa includes a spacious reception area and living room with a kitchen, a fireplace, two spacious bedrooms with a private bathroom each, a private garden and parking space. Each villa is approx. 150 mІ and can accommodate up to 6 persons. Wine and dine: Enjoy the unique gastronomic suggestions and accompany them with a bottle of wine chosen from a Bulgarian and international list at the б la carte restaurant of Euphoria Club Hotel & Spa. The Bar of Euphoria Club Hotel & Spa is at your disposal. Enjoy the exquisite variety of wines from different origins, a variety of beverages, enjoyable and refreshing cocktails and many different types of coffee. Spa and wellness: Discover the ultimate rejuvenation and well-being experience in the Spa facilities of high standards. The SPA centre offers indoor heated swimming pool, Jacuzzi, decorated with mosaics, steam bath and sauna. Conference facilities: Euphoria Club Ηotel & Spa features 3 functional and sophisticated conference rooms, which are the ideal choice for business meetings and corporate events, small and private meetings.